R.I.P. the exploit used by developers to root the device. Found by @comex in 2010. A 2 years old bug closed with iOS 6. 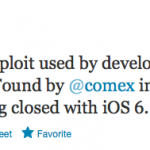 It's possible that comex told Apple about the exploit, which was the first way to jailbreak the iPad 2. One of the obvious conditions of his internship at Apple was for him to stop supporting the jailbreak community, according to a chat with Reddit. Now, this isn't all bad news for jailbreakers. The recently axed kernel bug exploit was unusable for a public release jailbreak because it required an iOS developer account. It's possible that the pieces of the iOS 6 jailbreak pod2g claimed to have remain unaffected by Apple. If not, the iPhone Dev Team's @MuscleNerd has already jailbroken the iOS 6 beta, which means that the lost exploit wasn't necessary for a future jailbreak. Regardless of what comex is doing with Apple, the rest of the jailbreak community will be able to find new exploits in iOS that will make public jailbreaks possible. Only time will tell if these exploits will remain open when iOS 6 launches to the public. Will you jailbreak iOS 6 when the time comes? Or, will you just tweak iOS 5 to your liking?